Macon Candy: See You on the Sweet Side: Candy's Land Joins Meatless Mondays! Although Mom spent nine months in the womb with no meat and three years as an herbivore here and there across the course of her life, she tends to fall off the veggie wagon and go on a red meat iron-inducing frenzy every now and again. Still, she's a grass-belly grazer at heart . . . and in her heart of hearts, she doesn't want to eat other animals. It's not just a love for all creatures great and small. She detests the cruelty of factory farming and the havoc it induces on our ecosystem. God may have created hunters when he kicked us out of Eden, but the industrial methods of slaughtering cows, pigs, turkeys, chicken, buffalo (yep) and gulp, horses, just isn't Kosher. No bones, thighs or filets about it. So, Mom has signed us up on the movement of Meatless Mondays. It's simple. 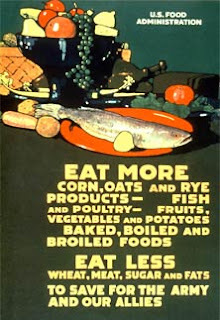 Cut out meat one day a week, traditionally Monday - just as they did during the days of conserving during World War II. The goal is to reduce meat consumption by 15 percent to improve the health and welfare of our greatest temples - our bodies and the earth in which they exist. Pre-heat oven to 400 degrees. Cook rice. Heat up the frozen veggie ground by mixing it in a saucepan or skillet with the tub (or jar) of salsa. Mix the rice in the veggie ground and salsa mixture. Quarter each pepper, leaving just the ribs, stem and seeds. Grease pan. Layer pepper slices. Fill with rice, veggie ground and salsa mixture. Season with spices. Layer with cheese. Bake for 15 to 20 minutes for a healthy, cheapie and wise supper.